In April 2013, a patron and staff group from the Nevada Museum of Art visited A27 Atelier Haus in Berlin, Germany. After spending a week visiting the city’s cutting-edge contemporary galleries, museums, and alternative spaces, entering Leiko Ikemura’s lofty, light-filled, minimalist space was an entirely different experience—like stepping into a temple dedicated to art. In her spacious studio, large scale-paintings punctuated the walls, and ceramic and bronze sculptures were elevated on low pedestals. Swiss architect Philipp von Matt designed this combination studio and residence for his wife, Japanese-born artist Ikemura. This exhibition presents a selection of paintings and sculptures by this accomplished and well-established artist, with a special focus on work that addresses aspects of the natural world: landscape and the female figures and animal creatures that inhabit it. Ikemura’s works describe conditions of loneliness, longing, and existential searching. 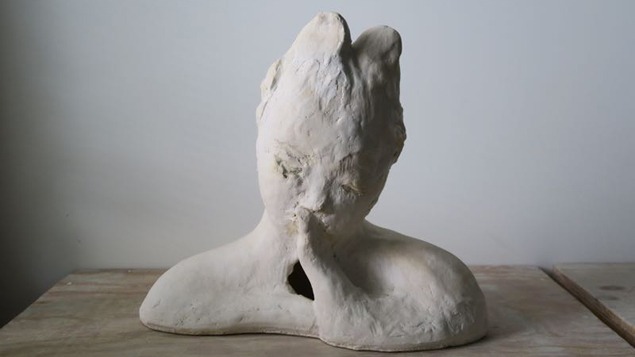 Solitary doll-like female figures recline, dreaming with closed eyes, while a sculptural figure covers her face with her hands, a gesture of both grief and transcendence of earthly reality. Other figures sit pensively, seeming to morph into features of the landscape they inhabit, becoming indivisible from the natural world. Oval ceramics in the form of human faces, displayed low on the ground, feature holes for their mouths, alluding to breathing and thereby existence. These works are informed by the artist’s experiences as an expatriate, her personal relationships, and the historically significant things that have occurred in her lifetime, such as the Fukushima Daiichi nuclear disaster of 2011. Born in Tsu, Japan, Ikemura left her native land at age twenty-one to escape “the strictness of Japanese tradition.” Beginning in the late 1970s, she pursued language studies in Spain, and attended the Academy of Fine Arts in Seville. She moved to Switzerland in the 1980s, living in Lucerne and Zurich, where she began to exhibit her work in group exhibitions. Ikemura’s first major solo exhibition was held in Bonn in 1983, launching her career in Germany. Before long she moved to Germany permanently, settling in Cologne in 1984. By 1992, she was offered a teaching post at the Berlin University of Fine Arts, where she taught painting from 1992 to 2015. Her work is documented in numerous catalogues and books, and is included in internationally prominent public collections, such as the Musée National d’Art Moderne, Centre George Pompidou, Paris, France; The Kunstmuseum Basel, Basel, Switzerland; the Kunstmuseum Linz, Lentos, Museum of Modern Art Linz, Austria; the National Museum of Modern Art, Tokyo, Japan; and the National Museum of Contemporary Art, Osaka, Japan, among others. Ikemura’s work has been shown in numerous exhibitions throughout Europe and Asia, however this is her first solo exhibition in the United States.